Recommended Citation: Kraft, T A and R Kakar. E-Commerce Security. In The Proceedings of the Conference on Information Systems Applied Research 2009, v 2 (Washington DC): §3364. ISSN: 0000-0000. 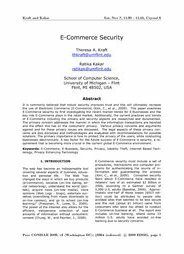 It is commonly believed that robust security improves trust and this will ultimately increase the use of Electronic Commerce (E-Commerce) (Kim, C., et al., 2009). This paper examines E-Commerce security by first investigating the recent market trends for E-Businesses and the key role E-Commerce plays in the retail market. Additionally, the current practices and trends of E-Commerce including the privacy and security aspects are researched and documented. The primary concern addresses the manner in which the information transactions are handled and the effect this has on the consumers’ privacy. Various privacy concerns and arguments against and for these privacy issues are discussed. The legal aspects of these privacy concerns are also discussed and methodologies are evaluated with recommendations for possible solutions. The primary importance is how to protect the privacy of the users, while conducting businesses electronically. A key factor for the future success of E-Commerce is security, a requirement that is becoming more crucial in the current global E-Commerce environment.